Constructed: first structure dated to around 184 B.C. Alterations: modified three times, the last in 203 A.D. The Lacus Curtius is a small open sanctuary which is situated directly on the open Forum area. 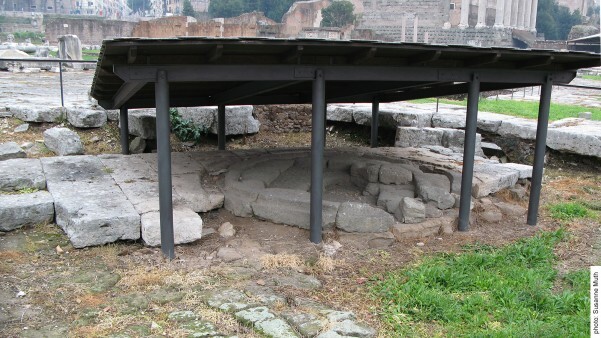 This place not only imparted an understanding of the mythical past of the Romans, but it was the scene of dramatic episodes within Rome’s history: For instance, Emperor Galba, who had proclaimed himself Emperor in 96 A.D., was stabbed to death by his opponents directly next to the Lacus Curtius. Scholars have argued that the monument was first erected during the Monarchy. Several ancient authors have written retrospectively about the event that caused the Lacus Curtius to be built. If one examines the literary sources more closely, then there are three different people named Curtius (which is where the Lacus’ name derives from: “Lacus” of Curtius) who can be associated with the construction of the monument. In one account, a Sabine horseman wondrously extracted himself from a dangerous swamp during the mythical period of Rome’s founding and then went on to decide the battle, which had been raging between the Romans and Sabines, in favour of the Romans. The swamp that is described in the literary sources certainly existed in the location of the Forum Romanum in the early period of Rome, because the valley in which the Forum was situated had to be drained, which is why the Cloaca Maxima was installed. In remembrance of this battle the swamp was named after the Sabine horseman Curtius. According to a second account, Marcus Curtius threw himself into a chasm, which had suddenly opened up on the Forum and closed itself again after this heroic act. A relief that was found nearby, whose copy is exhibited at the excavation site today, can presumably be connected to one of these two accounts. A third account describes lightning striking the exact spot where the Lacus Curtius was later built. The Romans interpreted this lightning bolt as a “miracle”, which prompted the Consul of 445 B.C., Curtius Chilo, to have the area fenced in. 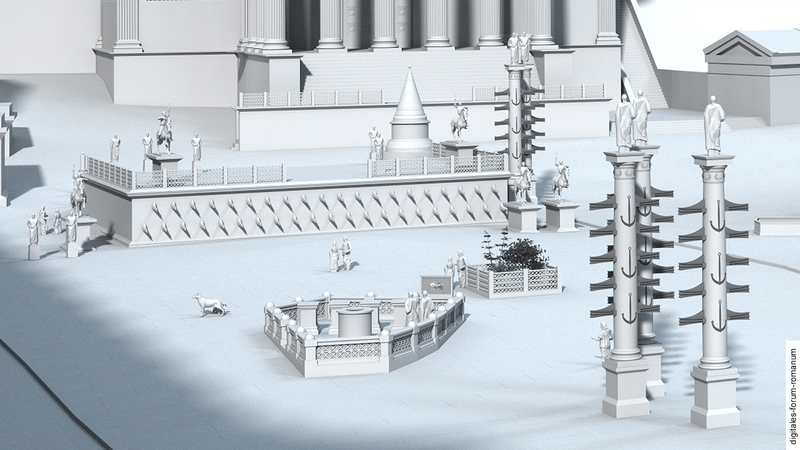 What is common to all of these accounts of the erection of the monument is that something “miraculous” occurred at this place in the early period (before the 4th century B.C., when the Forum was slowly developing into the public and political centre of the city). According to the literary sources, the first account with the Sabine horseman was especially widespread among contemporaries and this leads us back to the legendary time of Romulus. This turned the Lacus Curtius into a place of remembrance of Rome’s mythical founding period and guaranteed that the mythical past remained present on the Forum. 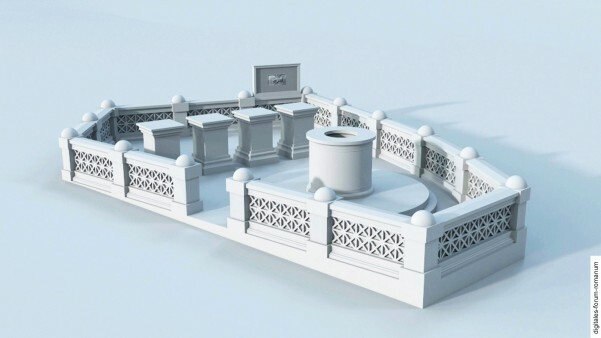 Interestingly, the Lacus served a further purpose – besides its function as a mythical memorial site – in the early Imperial Period: At that time the Lacus Curtius was used as a place to pray for the well-being of the Emperor as well as to donate money on his great day. It is no coincidence that Emperor Galba sought refuge here from his murders. Four different construction phases of the Lacus Curtius can be identified. The first phase that can be examined archaeologically centres around the foundation which is confined by tuff blocks. It is assumed that a puteal (wellhead of a water well) stood in the middle. This phase is dated to 184 B.C. In the second phase, the appearance of the Lacus changed substantially. The monument was made smaller and it lost a part of its ground area, whereas the layout of the remaining area was left unchanged. These modifications resulted in the puteal being moved and enlarged. The second phase is dated to 78-77 B.C., the period in which Sulla renewed the paving of the open Forum area. 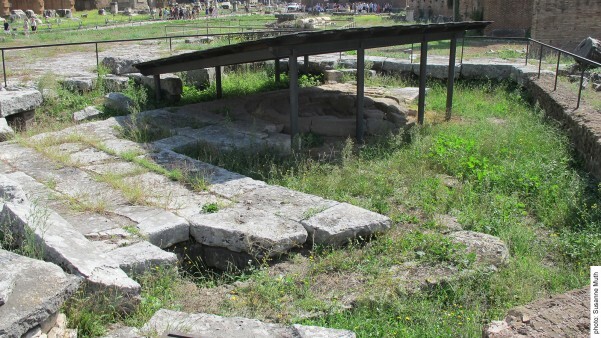 In the third phase it becomes evident that the Lacus Curtius was encased with travertine plates in the course of the new pavimentation during the Augustan period. Two water pipes (fistulae) were discovered under the puteal; it is also plausible to assume that a small balustrade was set up around the Lacus Curtius. This phase can be dated to the period between 12 and 9 B.C. The last phase can be dated to 203 A.D. 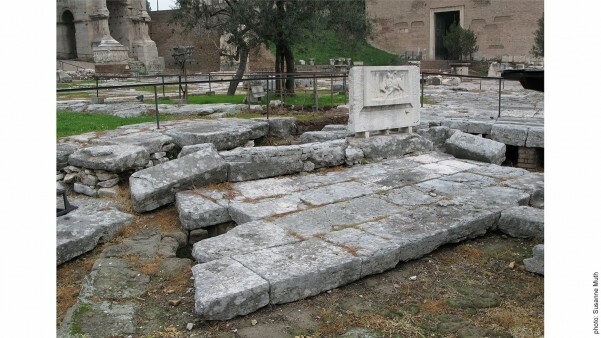 The elevation of the Forum’s paving resulted in the elevation of the Lacus Curtius and the renewal of the balustrade. The reconstruction of the Lacus Curtius is primarily based on the archaeological findings. In comparison to other structures, the Lacus Curtius was found in good condition. K. S. Freyberger, Das Forum Romanum. 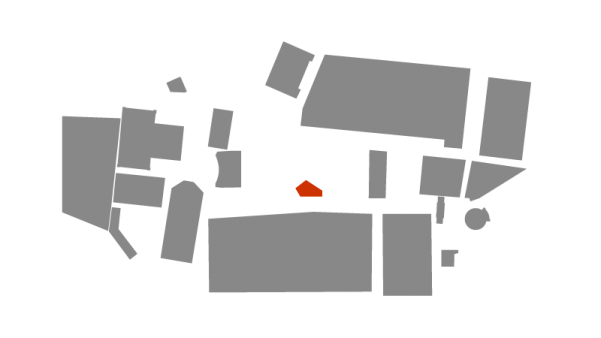 Spiegel der Stadtgeschichte des antiken Rom (Mainz 2009) 18-20. C. F. Giuliani, Lacus Curtius, in: E.M. Steinby (ed. ), Lexicon Topographicum Urbis Romae III, 1996, 166–167. C. F. Giuliani – P. Verduchi, L’area centrale del Foro Romano, Il linguaggio dell’architettura romana 1 (Florence 1987) 105-116. Ch. Hülsen, Die Ausgrabungen auf dem Forum Romanum, 1902–1904, Römische Mitteilungen 20, 1905, 68-69. G. Lugli, Roma antica. Il centro monumentale (Rome 1946) 157. B. Steinmann, R. Nawracala, M. Boss, Im Zentrum der Macht. Das Forum Romanum im Modell (Erlangen-Nürnberg 2011) 76-78.